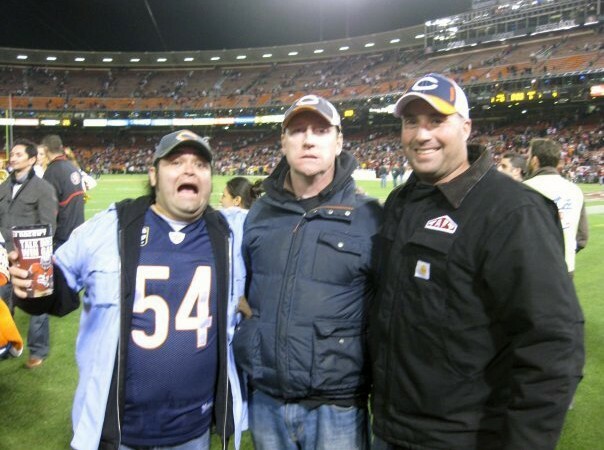 R.J. Vanecko (right) at Candlestick Park in Dec. 2009. Sandra Bullock, Robert De Niro, Cameron Diaz and Ricky Gervais each starred in a movie that Richard J. “R.J.” Vanecko – a nephew of former Mayor Richard M. Daley and of William Daley, President Obama’s White House chief of staff – helped finance. Vanecko – who the Chicago Police Department concluded this year threw the punch that led to the death of David Koschman during a drunken 2004 confrontation on Division Street – was paid more than $200,000 as a consultant to Cardinal Growth, company records obtained by the Chicago Sun-Times show. The owners of the Chicago firm, Robert Bobb and Joseph McInerney – who also have had business deals with Vanecko’s brother, Robert Vanecko, and their cousin, Patrick Daley, son of the former mayor – hired R.J. Vanecko to work on an investment fund they created with Radar Pictures movie mogul Ted Field, a former owner of the Sun-Times. R.J. Vanecko did movie-industry research and worked with investors to secure financing for four movies, all released in 2009: “Everybody’s Fine,” which starred De Niro; “The Invention of Lying,” starring Gervais; “All About Steve,” starring Bullock; and “The Box,” starring Diaz. Cardinal Growth was paid a yearly management fee of $150,000 for work on the movies, which it split with R.J. Vanecko between late 2006 and March 2009, the records show. Vanecko also got a $47,500 bonus. Businessman Kevin Flynn, who is among the investors in the Chicago Sun-Times, said he invested in the film fund but didn’t make that investment through Cardinal Growth. Flynn said he does have a “small investment” in one of Cardinal Growth’s venture-capital funds. He said he had no involvement or any financial interest in Cardinal Growth’s investments in companies that won city contracts to provide Wi-Fi service at O’Hare and Midway airports and to do sewer inspections. R.J. Vanecko, 36, no longer works for Cardinal Growth but still lives in Southern California and works in the entertainment industry. Seven years ago, R.J. Vanecko punched Koschman in the face, knocking the 21-year-old Mount Prospect man to the ground, where he cracked his head on the street, suffering brain injuries from which he died 11 days later. Vanecko and a friend ran away. Witnesses couldn’t pick Vanecko out of a lineup. The police and Cook County prosecutors decided no charges could be filed in the case. It remained an unsolved homicide until earlier this year, when the police reinvestigated the case after the Sun-Times sought copies of the department’s reports on Koschman’s death. The police concluded their reinvestigation on March 1, deciding that R.J. Vanecko threw the punch but shouldn’t be charged. They said it was self-defense. Koschman had been arguing with a friend of Vanecko’s, though witnesses said Koschman wasn’t being physically aggressive. Joseph Ferguson, the city of Chicago’s inspector general, is now investigating the police department’s handling of the case, prompted by reports in the Sun-Times that revealed discrepancies between what witnesses say happened in the confrontation in the early-morning hours of April 25, 2004, and what the police say those witnesses told them.